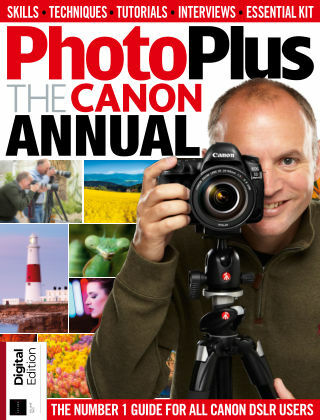 With Readly you can read PhotoPlus Annual and thousands of other magazines on your tablet and smartphone. Get access to all with just one subscription. New releases and back issues – all included. "Divided into clear sections, we’ve included your favourite features from the magazine, such as The Apprentice, The Pro Interview, CanonSkills and CanonSchool, as well as in-depth guides and more. Learn techniques from expert photographers, take inspiration from stunning imagery, follow step-by-step tutorials, and download free video guides from the FileSilo. Whether you want to master your DSLR, get to grips with Canon’s software, or tackle creative projects in Photoshop and Lightroom, this is the ultimate companion for all Canon photographers. Inside you'll find: -The eagle has landed Take great portraits of birds of prey in Canon pro Tim Flach's studio - Great garden photography Capture marvellous macro shots of plants and flowers - Perfect Portraits Light and capture a variety of studio portraits with Emma Finch - Seaside to seascapes Capture stunning seaside scenes and long-exposure seascapes - Master your canon lenses Get the most out of your Canon lenses with this essential guide - Gig photography masterclass Are your camera skills up to the unique challenge of a live music event? - Zone-focusing Capture sharp candid shots of strangers on the street - Urban architecture Find an expressive way to shoot modern buildings - Panning for gold Slow down action and blur the backgrounds of moving subjects - Boost tonal range Learn how to solve the problem of harsh sunlight - Environmental portraiture Add to the atmosphere in your portraits - Photograph new babies Discover how to shoot portraits of newborn babies - Wonderful windmills Learn how to shoot more creative compositions of landmarks - Classic clifftops Improve your photos of beautiful, high-vantage coastal seascapes - The brenizer effect Create panoramic portraits with a unique effect - Shot in the dark Capture dazzling portraits during the darkest hours - ND filters with flash Both blur and darken backgrounds to capture more dramatic portraits - 50 Canon tips Learn great new ways to master your DSLR's settings - Take control of tones Use clever adjustment layers in Photoshop Elements - Make perfect prints Prepare for printing by enhancing colours and sharpening in elements - Sky-high selection skills Make complex cutouts with ease in Photoshop CC - Spring a leak Use templates and layer effects in Photoshop CC to create a retro light leak effect - Make minimalist moody monos Convert a long exposure to black and white in Lightroom - Controlling colour Correct colour casts and enhance Raw images in Lightroom - Jillian Edelstein Talks about her South African roots, her dream job and Nelson Mandela - Tom Jenkins Award winning sports photographer on watching keenly from the side-lines - Neil McIntyre The Scottish wildlife specialist talks about inspiration, equipment and more - Digital Photo professional 4 Import and sort your Raw images using Canon's DPP4 - Focusing for close-ups Get closer and capture the finer details on photos - Reading the histogram Learn how the graph on your camera can help your exposures - Take control of tonal range Rein in overexposed highlights and unexposed shadows - Getting a photography job Discover how to get a salary photography job - Maintaining your Canon kit Discover how to carry out maintenance on your kit - Produce accurate colours Counteract colour casts and tints caused by different colour temperatures "